Midway through 2018, we see investors globally demonstrating caution and looking to insulate their portfolios, especially in light of renewed volatility, uncertainty around global trade policies, and rising interest rates. Bonds offer investors a relatively safe place to invest their money compared to equities. When share markets sell off, investors typically switch out of equities to bonds, because bonds are less volatile and pay regular interest. Rather than sit idle in cash, investors can consider government bonds, corporate bonds, and cash equivalents which offer a safe haven and regular income to investors with each providing a mix of stability and income to suit investor needs. Yet it hasn’t always been easy for retail investors to access the fixed-income markets or to diversify their bond investments. 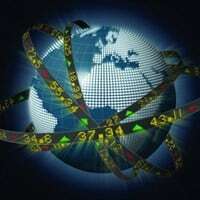 The first fixed-income exchange-traded fund (ETF) debuted on the Australian Securities Exchange (ASX) in 2012. Since then, fixed-income ETFs have gathered over A$4.5 billion in assets on the ASX, with 26 fixed-income ETFs now available to Australian investors today. Globally, the trend is similar with fixed-income ETFs having grown from 17 ETFs with US$6 billion assets under management (AUM) in 2003 to over 900 ETFs with over US$700 billion AUM in 2017. Even still, $700 billion AUM in fixed-income ETFs represents less than one per cent of the global bond markets. If the growth in equity ETFs were any indication, fixed-income ETFs could continue to grow at double digits and reach US$2 trillion in AUM in the next 15 years. Why have fixed income ETFs seen such phenomenal growth? Simply, fixed-income ETFs have modernised bond markets. Unlike stocks, most bonds are traded over-the-counter (OTC) in secondary markets. With the development of fixed-income ETFs, investors have been given simpler access to bonds on stock exchanges, including the ASX. This enables both retail investors and institutions to invest in bonds easily. Through fixed-income ETFs, investors have cost-effective exposure to hundreds of individual bonds in a single trade, across multiple sectors including government, investment-grade, high-yield or emerging market bonds, both locally and globally. Fixed-income ETFs, which include cash equivalents ETFs, are now used for a variety of purposes including liquidity management, diversification of bonds, transition management, and opportunistic tactical allocation. As the size and liquidity of fixed-income ETFs continue to grow, adoption among investors is likely to increase as well. Fixed-income ETFs have democratised access to bond markets. Traditionally, the OTC nature of bond markets favoured large, sophisticated investors with the size and scale to take advantage of efficiencies in trade execution to getting allocations to new issues. 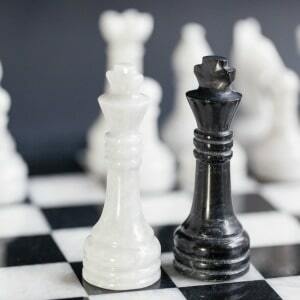 However, bond ETFs have levelled the playing field by allowing investors of all shapes and sizes to access fixed-income markets in an efficient and low-cost manner. All investors can now access thousands of bonds in a specific sector with a single ticker, and without having to overcome the challenges associated with the OTC market. Fixed-income ETFs are available on the stock exchange without relying on the OTC market. 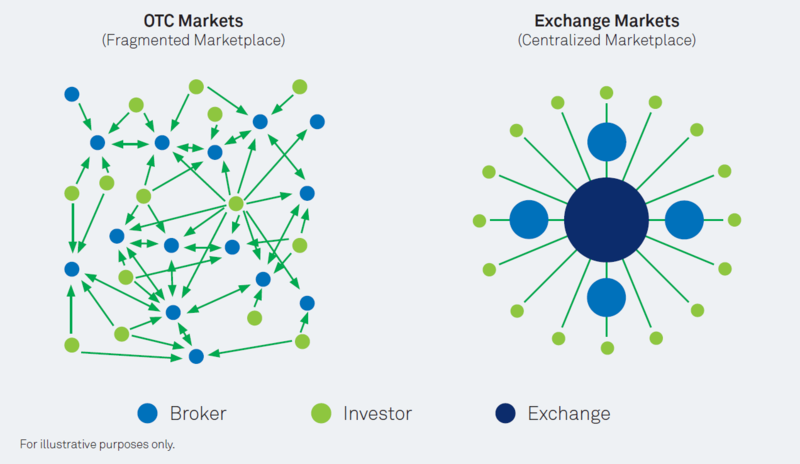 A centralised exchange enables investors with full transparency into trading volumes, pricing and transaction costs, making them valuable tools for navigating markets. Bond ETFs allow investors to access bonds the same way they can access stocks. By taking bonds which are traditionally accessed in OTC markets and putting them on the stock exchange, an additional layer of liquidity is created when gaining exposure to fixed income. Investors can continue to access bonds in OTC markets, but they can now also access bonds via ETFs on the stock exchange. Bond ETFs can be bought and sold among investors on the ASX without relying on the opaque OTC market. For example, the liquidity of bond markets is illustrated below. 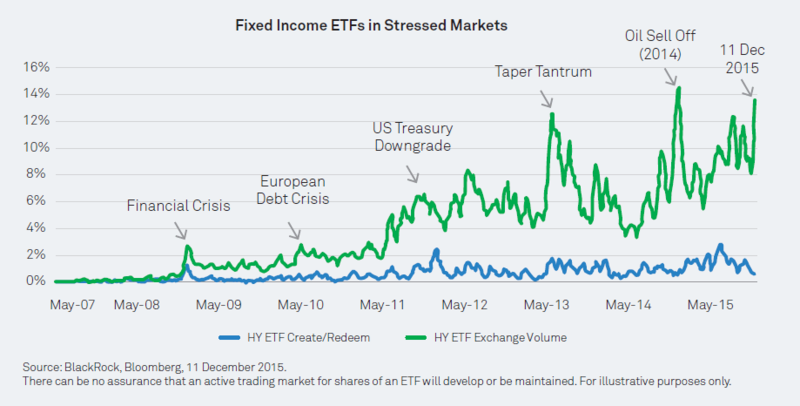 When stressed market conditions resulted in significant spikes to trading volumes of high-yield ETFs, it did not result in spikes in the creation or redemption of high-yield ETFs. HYG refers to iShares iBoxx $ High Yield Corporate Bond ETF. Source: BlackRock and Bloomberg as of 6/15/2016. Chart three is a powerful example of how fixed-income ETFs provide investors with the continued ability to manage their investments in stressed environments. During times of market stress, this additional liquidity enables clients to express a view on fixed income without having to buy and sell bonds via the OTC market. Fixed-income ETFs are also cost-effective and generally offer price improvement to trading underlying securities, making ETFs less expensive to trade than a comparable portfolio of bonds. Relative to a basket of bonds, ETFs also offer the benefit of on-exchange liquidity which often results in lower transaction costs. 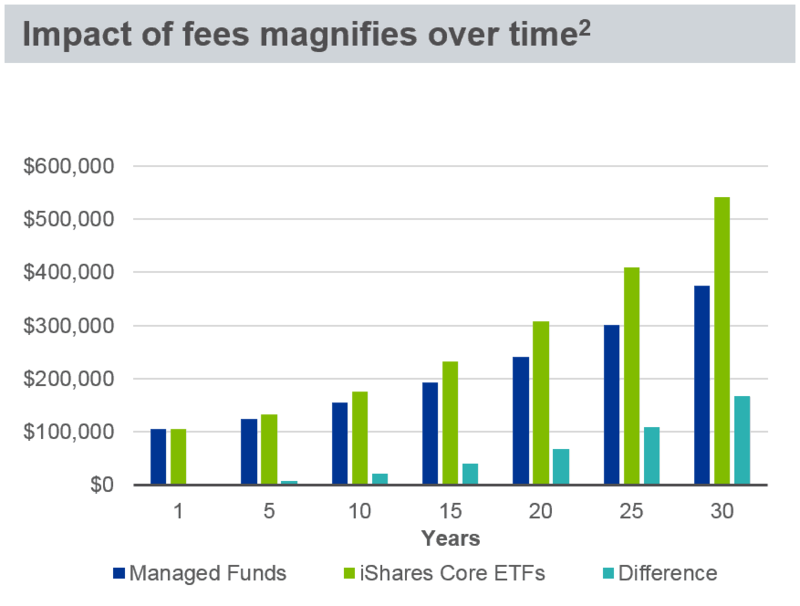 Even when compared to existing managed funds with equivalent exposures, fixed-income ETFs can result in lower fees for investors which can have a significant impact on performance over the long-run. For example, iShares Core ETFs, which include broad market exposure to both bonds and cash-equivalents, offer an average management fee of 0.17 per cent per annum on the ASX versus other similar products on offer such as ASX-listed ETPs, which offer an average management fee of 0.49 per cent per annum, and managed funds which offer average an management fee of 1.4 per cent per annum. This is important because the impact of fees magnifies over time as illustrated below. Through fixed-income ETFs, investors can now follow asset allocation guidance or express their own investment views with precision. Before ETFs, many investors relied on active mutual funds or individual securities to access the bond markets. 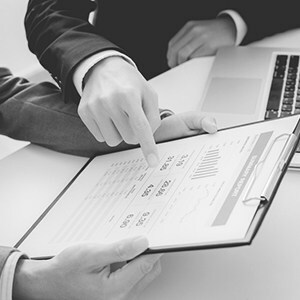 Today, financial advisers and investors can increase or decrease allocations to specific sectors more efficiently than you could otherwise do in the OTC bond market, and at a lower cost. It also allows investors to differentiate between exposure and alpha. In summary, fixed-income ETFs bring a number of significant benefits to investors. While most pay regular interest payments like bonds, they also offer the benefits of an ETF including ease of access, intraday trading, liquidity, transparency, and relatively lower costs compared to similar exposures. We anticipate the popularity of fixed-income ETFs to continue to grow both globally and in Australia. Christian Obrist is head of BlackRock's iShares business in Australia.